Released in 1980, produced by MS Reddy and directed by BV Prasad. 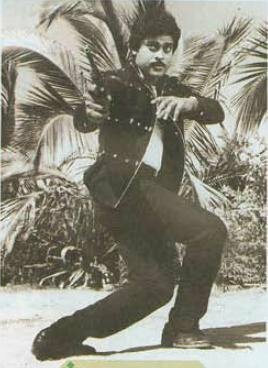 Though Chiranjeevi is the hero, the title character is donned by Nuthan Prasad. NP`s son settles in Bombay and his kids (Chiru and Deepa) grow up with an ultra-modern culture. Bhargav (Chiranjeevi) has a maradalu (sister-in-law), Geetha back in their village and Nuthan Prasad wants both of them to get married. When he goes to Bombay with the marriage proposal, he finds out that Chiru is not in a mood to marry a palleTUri gabbilAyi (Village girl) and that he has already been trapped in the net of an oppotunistic girl, Seema. Nuthan Prasad poses as a rich old man and romances with Seema. The money-minded Seema wants to marry the old man and leaves the frustrated Chiru in lurch. Once Chiru realizes what the real character of Seema is, he agrees to marry Geetha. Best song was picturized on Chiru and Geetha.